How did you get into running? I was in 4th grade when I started running with CYO (Catholic Youth Organization) and haven’t stopped since! I ran all 3 seasons in high school cross country, indoor and outdoor track. I ran collegiately for two years at Keene State College. What race are you currently training for? I am currently training for Pocono Marathon on May 15, 2016 along with some races in between like the Love Run Half Marathon! Sounds like a busy race season, how is training going so far? Training has been great! I have a coach who really helps me out with mileage, workouts and goal setting. Are there any products or running gear that you can't live without this training season? Anything Oiselle!! My Winter favorites are the Gilman Vest and KG Tights. I also LOVE my TomTom Runner Cardio watch. What have been the "ups" of training this season? Some of the ups include running with City Fit Girls and my friends -- it's awesome to be able to talk with people and make the time go faster! And the downs? I was injured last summer for three months and was planning on doing the Philadelphia Marathon. I was unable to race or run so getting back into shape and running everyday has been a challenge this season. Have you run into any other training challenges besides overcoming injuries? Finding time between school and work and staying motivated to run outside in this crazy weather has been tough! However, setting goals can help motivate you to wake up early, get moving, run, cross train or lift! So what exactly are your goals for this year? My running goals for 2016 are to run a sub 1:40 half at the Love Run Half Marathon, sub 3:20 marathon at Pocono Marathon and sub 1:35 for the Philadelphia Half Marathon! Have you ever set a goal that you didn't reach? When I ran the Philadelphia Marathon in 2014 I wanted to Boston Qualify (BQ) so I revolved my training around running an 8:12 mile/pace -- It was my first marathon and I had no idea what I was doing. It did not happen and I was no where close to running 3:35, I ran 3:53 and was heartbroken when I realized at mile 17 that there was no way I would be able to negative split the last 9.2 miles. I was upset and happy at the same time, I was glad I ran my first marathon but upset that I did not run the time that I wanted. Many of the women in our network are new to running. What can new runners do to improve their running? Lift weights. I have found that doing arms and abs every other day and has really improved my form and posture while I am running. Make Goals! Write down your goals (next to your training program) hang them up so they motivate you to stick to your training plan everyday. Run in the morning- it is sometimes very difficult to get up early to run but it is so rewarding to have run, and have a jump start on your day! Reward yourself for every week or a step you take in your training, it is an amazing accomplishment to get one step closer to your goal! 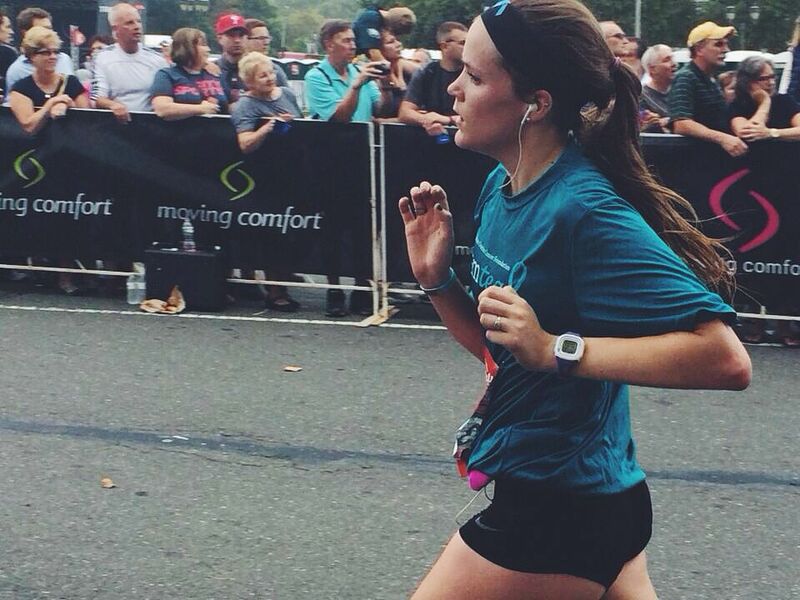 Kristen is nutrition student at Drexel University and a Oiselle Volee runner. Follow along her training program on Instagram @runitkris and Twitter @kjo__.